Education Erp Market Segmented by Company Profile : SAP SE, Dell Technologies Inc., Oracle Corporation, Adobe Systems Incorporated , Blackbaud, Inc., Workday, Inc., Ellucian, Foradian Technologies, Infor Inc., Epicor Software Corporation, Creatrix Campus, Pagely, Inc., Skyward, Inc., 2i Technology, PCR Educator. The education Enterprise Resource Planning (ERP) market is still in the emerging stage in various developing nations, such as India, China, Mexico, and several others. On the other hand, several players operating in the global education ERP market are continuously striving to develop innovative education ERP solutions that are more precise, and serve multiple application areas simultaneously. Education ERP solutions enable customers to manage their data in an organized manner. The executive summary consists of a comprehensive summary of the global education ERP market. This comprehensive summary includes the overall global education ERP market outlook, and the various trends in the supply and demand sides of the market. In addition, this section offers business growth-related recommendations and opportunities to look forward to in the global education ERP market. The forecast factor analysis has been added at the end of the executive summary. An education ERP solution enables the integration of different functions of an educational institution in real time to maintain databases and manage multiple functions efficiently. Many education institutions are adopting education ERP solutions for managing their data digitally and systematically. Also, an education ERP systems tracks business resources, such as raw materials & cash, analyzes production capacity, and performs several other functions. An education ERP solution simplifies the information flow between different business functions, and is also responsible for updating the priority stakeholders. The market study offers an elaborate analysis of the global education ERP market and features market-related insights on the macroeconomic and forecasting factors influencing the adoption of education ERP technology and its practicality for modern applications. An education ERP market study includes an exhaustive analysis of the key market drivers, market challenges, and the overall market structure. An elaborate market analysis has been performed for each education ERP market segment with regards to the market size in the education ERP market in every region. This chapter also offers an exhaustive analysis that discusses the current nature of the trends in the global education ERP market. The next chapter in the education ERP market study showcases a detailed analysis of the market across specific countries in different regions. It offers an estimated market viewpoint for the forecast duration of 2018 to 2028. This estimation includes the trending technological innovations and product offerings in the education ERP market. This chapter offers an impact analysis that discusses the degree at which market dynamics are influencing the growth of the global education ERP market in every region. Market forecasts and analysis for key emerging countries (India, China, and Mexico) based on key market segments has been provided in the education ERP market report, as an extension to this section. The final chapter of the global education ERP market research report includes a competitive landscape that provides a dashboard view of the key competitors operating in the education ERP market. Some of the key players of the education ERP market profiled in this section include Foradian Technologies., Workday, Inc., Ellucian, Epicor Software Corporation, Infor, Inc., Adobe Systems, Dell Inc., Oracle Corporation, Blackbaud, Inc., and SAP AG. The market study was started by deducing the existing market size, which formed a platform that enabled analysts to understand the future prospects of the growth of the education ERP market. The study deduces the overall growth trend using different methods of market analysis and as per the technological advancements in the global education ERP market. As highlighted previously, the global education ERP market is segregated into different market segments. Analysis has been performed in terms of the segmental Basis Points System (BPS) to feature the distinct contributions made by individual segments to the growth of the global education ERP market. This data plays an important role in identifying various trends in the global education ERP market. After thorough secondary and primary research of the global education ERP market, the scope of the research study was restricted to the major application segments, and the regional markets within the global education ERP market. Education ERP market forecast and projections have been determined assuming the fact that there would be no major environmental factors responsible for a sudden shift during the forecast period. The market estimation and forecast for the education ERP market has been determined considering the average pricing of major products across geographies. In the global education ERP market report, a minimal change in the regulatory requirements has been assumed during the forecast period. Due to the rising adoption of technology products, the worldwide ICT spending is increasing prominently due to the usage of consumer electronics, smart devices, & software, and the continuous launch of new IT & communication technologies in the past three years. Increasing urbanization in emerging as well as developed economies, coupled with a growing middle-class population, has led to a surge in the adoption smart education ERP solutions worldwide. There has been growth in the adoption of smartphones among individuals due to the increasing usage of digital technologies, such as online banking, online education, web-based services, and others. Increasing demand for smart education systems with innovative software will continue to the generation of substantial demand for education ERP. With an increase in technological advancements, the demand for Internet-enabled devices has increased from children and young consumers. The features of internet-enabled devices are expected to drive the demand for the education ERP market across the South Asia region. As the trend of digitalization is encouraging people to adopt new technologies, the education sector is also transforming and adopting new education ERP solutions. The replacement of device-based computing, increasing connectivity & hardware, privacy of several cloud-based resources, emerging online & collaborative learning, and the personalization of technology are among the major factors contributing to the growth of the education ERP market. Growth in the number of educational institutions across the globe has boosted the implementation of education ERP software to improve the efficiency of various organizational practices. Education ERP systems can track business resources, which include raw materials and cash among others, while it can help to analyze the production capacity and monitor the status of purchase orders & payroll. The education sector is increasingly outsourcing complex management processes to third-party vendors. In schools and universities, education ERP systems enable the smooth management of Student Information System (SIS), payroll, accounting, placement management, transport management, enrolment, and admissions, among others. These are some of the primary factors driving the education ERP market worldwide. Education ERP solutions are available in mobile devices, mobile apps, and desktop computers. However, in the developing countries of South and East Asia and Middle East and Africa (MEA), people are not familiar with the benefits of employing education ERP solutions due to lack of awareness regarding the same. Most educational institutions are unaware of how education ERP solutions can help manage the data securely with maximum flexibility, which may negatively impact growth of the education ERP market. The global education sector is experiencing a shift in e-Learning models, fuelled by the exponential demand for connected devices and digital education across the world. Moreover, these educational advancements are expected to change the personal learning experience of end users, as well as offer business opportunities for education ERP solution developers. The global education ERP market represents a consolidated competition landscape, wherein Tier 1 companies hold a revenue share of more than 42.4%. Important entrants in the education ERP market, such as Workday, Inc. and Foradian Technologies, are strategizing on new product launches. 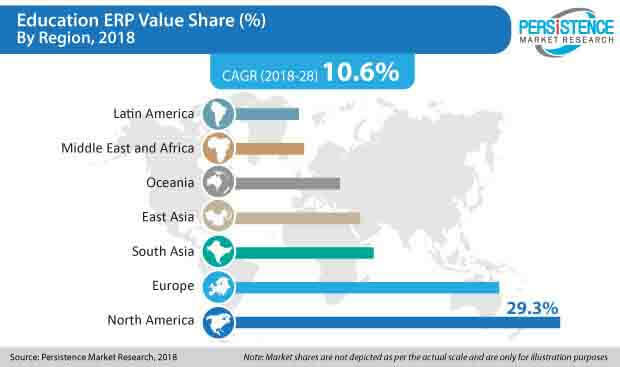 While most of the key education ERP market players maintain a strategic focus on the South Asia and European markets, the report underscores that collaborations with other education ERP solution providers will be an important developmental strategy for companies to expand their customer base. The number of manufacturers of new and innovative education ERP solutions is increasing at a rapid pace.